Brian Burke, President and General Manager of the Toronto Maple Leafs, announced Friday that the team has traded defenceman Tomas Kaberle to the Boston Bruins. In exchange, the Maple Leafs will receive centreman Joe Colborne and Boston’s 2011 first-round draft pick, plus a conditional 2012 second-round draft pick. Colborne will report directly to the Toronto Marlies (AHL). 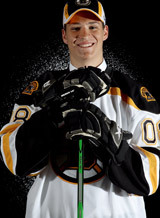 Colborne, 21, was Boston’s first-round selection, 16th overall, in the 2008 NHL Entry Draft and he is currently playing in his first professional season. He is currently third in goals (12) for Providence and tied for third in team scoring this season with 26 points. The Calgary, Alberta native spent two years at the University of Denver and was named to the All-WCHA Rookie Team in 2008-09. Colborne was named to the WCHA Third All-Star Team in 2009-10. Kaberle is 11th on the Maple Leafs’ all-time points list with 520 points and 8th in games played with 878. He also ranks fifth in assists (437) and second in regular season overtime goals (7). Only Tim Horton and Borje Salming have played more games at the defence position in a Toronto uniform. He also holds second spot on the team’s all-time defenceman points and assists lists behind only Salming. This season he leads the Leafs in assists (35) and he is third in blocked shots with 100. Kaberle, 32, represented the Maple Leafs at four NHL All-Star Games and he participated in the past three Winter Olympic Games for the Czech Republic.